Ask Modern Farmer: What’s Wrong with my Tomato Plants? 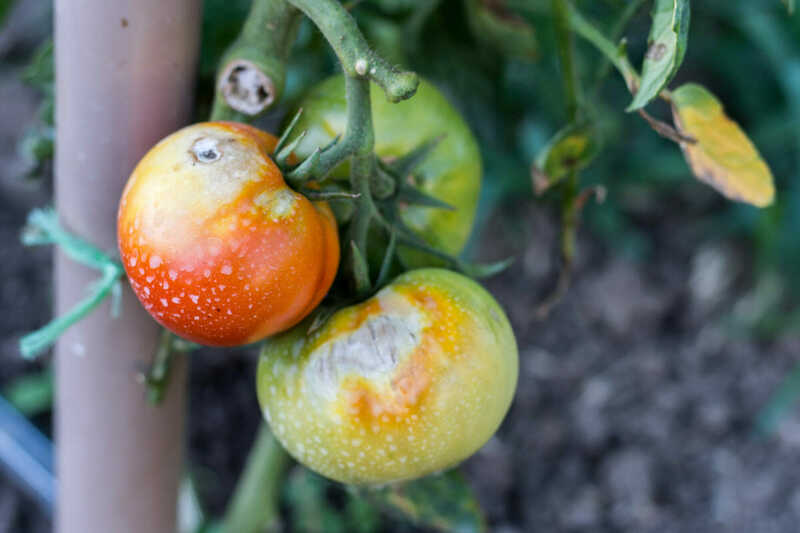 Blights, wilts, spots and rots: a complete guide to diagnosing and dealing with the ugly foes attacking your heirloom beauties. Warm, wet weather encourages the growth of most tomato diseases. They spread slowly in spring and early summer, and often go undetected at first. 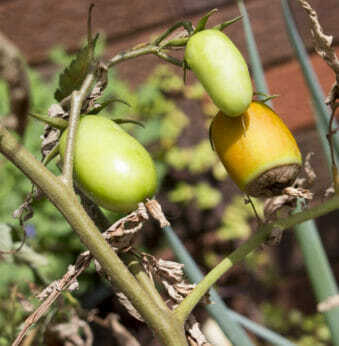 Then suddenly, by mid-July, your tomato plants look like they’ve been through a war: half the leaves are yellow, while your nearly ripe fruit is suddenly splotched with oozing sores. Here’s our guide to diagnosing, and dealing with, the most common tomato diseases. While you might be inspired to make a last-ditch effort to save the crop, the sad truth is there is little you can do once disease takes hold. In mild cases, you might be able to obtain a modest harvest from an infected plant, but in severe cases even bombing your tomatoes with chemical fungicides will have little effect. A better bet is to make a plan for how to prevent the problem next year. Tomato blights come in two forms: early and late. Early blight causes ¼- to ½-inch brown splotches on the leaves, with a characteristic yellow “halo” around each one. The disease starts on the lowest leaves early in the season and works its way up. If the weather remains on the dry side, the plants typically survive, though yields may be reduced. In wet weather, the disease can consume the plant, causing the fruit to rot before it ripens. Late blight is a bit of a misnomer, as it can occur at any time in the season; though it rarely makes itself known before midsummer. Unlike early blight, the “late” version causes discoloration all over the plant. Late blight is the more aggressive of the two, often destroying the crop in short order. 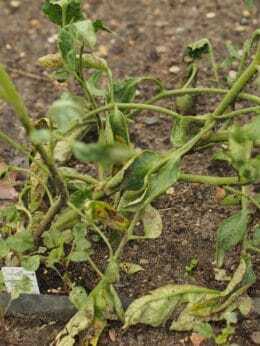 Several insidious diseases cause tomato plants to rapidly wilt and die. The visual cues for verticillium wilt and fusarium wilt, two of the most common, are nearly identical. Like early blight, the symptoms typically start at the base of the plant and work their way up. But rather than splotches of discoloration, the leaf wilts and turns yellow. Another telltale sign: in the earliest stages, the yellowing often occurs only on one side of the plant, or sometimes just on one side of individual leaves. The main difference between the two is that fusarium is more common in hot weather, while verticillium prevails in cool spells. Plants suffering from bacterial wilt meet the same fate, but this disease starts at the top of the plant and works its way down. Because the leaves remain green at first, bacterial wilt is often mistaken as a sign that the plant needs water. No amount of irrigation causes it to recover, however, and the leaves quickly turn yellow and die. Cankers are deadly tomato diseases that start with discolored leaves and eventually lead to oozing lesions on stems and fruit. There are two main types. 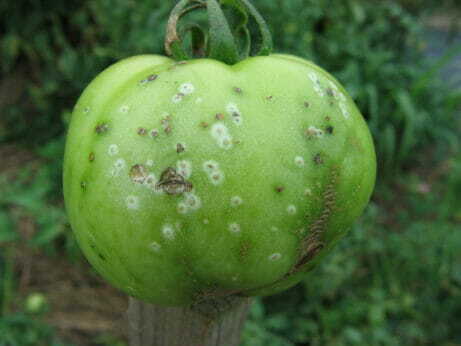 The most common is bacterial canker, characterized by the appearance of small brown lesions with a white halo on green fruit; the spots eventually grow into raised humps. 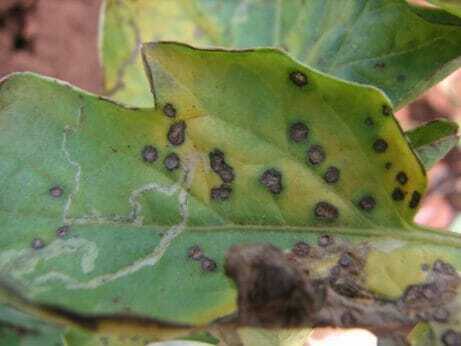 Alternaria canker, the other type, is characterized by sunken gray lesions on ripening fruit. Numerous tomato diseases include the words “spot” or “speck,” but the most common by far is Septoria leaf spot. The symptoms resemble those of early blight: small round spots appear on the lower leaves, eventually colonizing the entire plant. Unlike early blight, however, the discolorations caused by Septoria leaf spot lack a yellow halo; they are distinguished instead by a black dot in the middle. 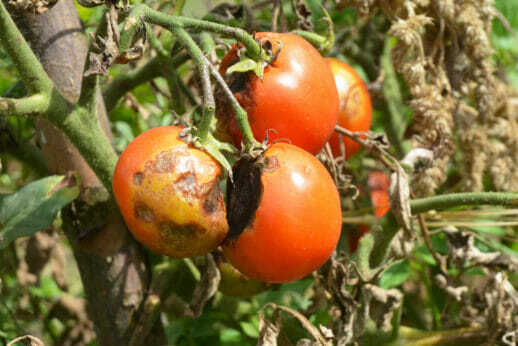 The number of tomato diseases that include the word “rot” is too long to list. Some rots (a generic term for various fungal diseases) attack the roots or leaves first, but perhaps the most worrisome are those that go straight for the fruit. These often show up on perfectly ripe fruit, sometimes even after it has been picked. The location and appearance of the rot depend on the pathogen in question. NOTE: It’s important to note, however, that blossom end rot, one of the most common of the so-called rots, is not the result of a pathogen, but of a calcium deficiency in the soil. Blossom end rot is characterized by soggy brown flesh at the base of the fruit opposite the stem. There is no cure, per se, for any of the diseases listed here. But there are ways to prevent their spread. Chemical warfare can help prevent tomato diseases from becoming established, but this means spraying on a weekly basis starting from the day the tomatoes are transplanted. Natural alternatives include copper sprays, Bordeaux mixture and biological products like Serenade. But keep in mind that, while natural, many of these products still have a detrimental impact on human health and the environment when used frequently. That series of letters you see next to the cultivar name on the nursery label or seed catalog listing? It’s a code for the diseases that the variety is resistant to. The most commonly seen designation is “VFN,” which refers to varieties resistant to verticillium and fusarium wilts, plus nematodes, a soil-dwelling insect that attacks tomato roots. But breeders have developed tomatoes that are resistant to many other diseases. Click here for a comprehensive list of disease-resistant varieties and here a list of disease resistance codes.